VANCOUVER — Jay Beagle will resume a new NHL career lease Tuesday – and Josh Leivo will start one. 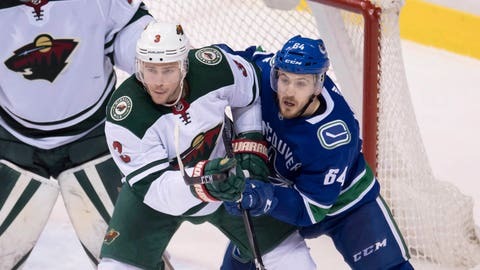 Beagle is slated to return to Vancouver’s lineup as the struggling Canucks (11-15-3) host the Minnesota Wild (14-10-2). “It was fun to be out there with the boys and get back at it and get some battles,” Beagle told reporters after a practice Monday. The 33-year-old center suffered a fractured forearm only five games into his new contract with the Canucks after helping the Washington Capitals win the Stanley Cup last season. Now, Canucks coach Travis Green and general manager Jim Benning hope his veteran presence can shore up a youth-laden roster and reduce do-everything middleman Bo Horvat‘s workload. In addition to being Vancouver’s top scorer, Horvat takes the majority of Vancouver’s face-offs. With Beagle back on board, Horvat will likely get to rest more often when the puck is dropped in Vancouver’s defensive zone. The Canucks are trying to end a slump in which they have earned just one victory in 12 games while enduring several injuries. Green suggested that Beagle could help Vancouver’s young stars like Elias Pettersson and Brock Boeser learn how to generate wins after assisting the likes of Alex Ovechkin and T.J. Oshie with their career growth in Washington before departing the Capitals as a free agent. “He’s definitely a great leader and he understands what it takes to win in this league from, maybe, a different look,” said Green. Meanwhile, the Canucks hope Leivo, 25, acquired in a trade from Toronto for farmhand Michael Carcone, 22, can make up for the inconsistency of winger Brendan Leipsic, who was claimed off waivers by Los Angeles on Monday as Vancouver failed to complete his demotion to the minors. Leivo, a six-foot-two and 192-pound Inisfil, Ont., native is expected to play on one of Vancouver’s top two lines against the Wild. Leivo produced four goals and two assists in 27 games with Toronto this season and has 28 points in 84 NHL career games after being drafted in the third round by the Maple Leafs in 2011. The winger told Vancouver radio station Sportsnet 650 that it was time to change teams after he struggled to earn permanent employment with a Toronto club that features several young stars. Meanwhile, the Wild is looking for a change in results after suffering three straight losses for the first time this season. “Three games were there for the taking – the problem is, we didn’t take ’em,” Minnesota coach Bruce Boudreau told reporters after a practice at home Monday before leaving for Vancouver. Boudreau hopes a three-game trek through Western Canada will help his club improve defensively and rediscover its winning ways. The Wild has lost six of its last nine games overall. But Minnesota does not want to reproduce its previous showing in Vancouver. The Canucks tamed the Wild by a 5-2 count at Rogers Arena on October 29.